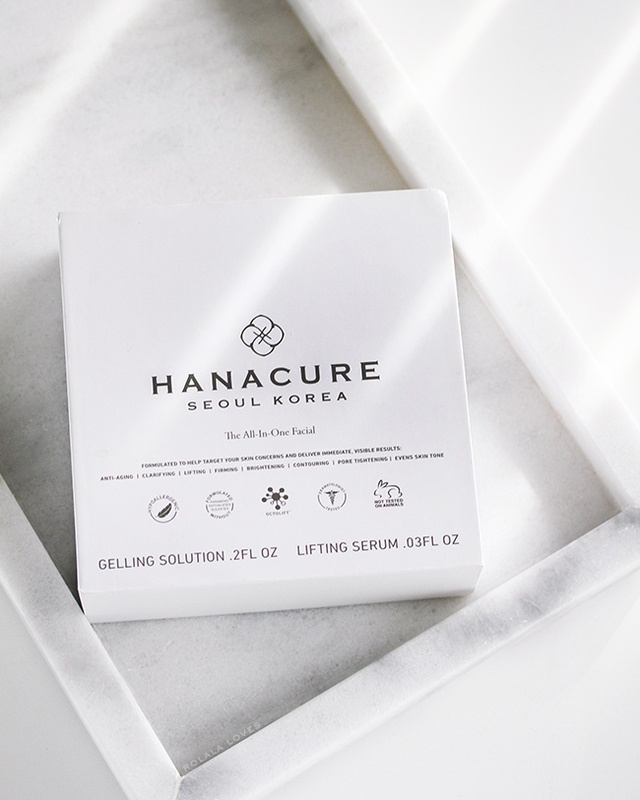 The Hanacure All-In-One Facial comes from South Korea which should come as no surprise considering the country's cutting edge developments and innovations in the skin care industry. 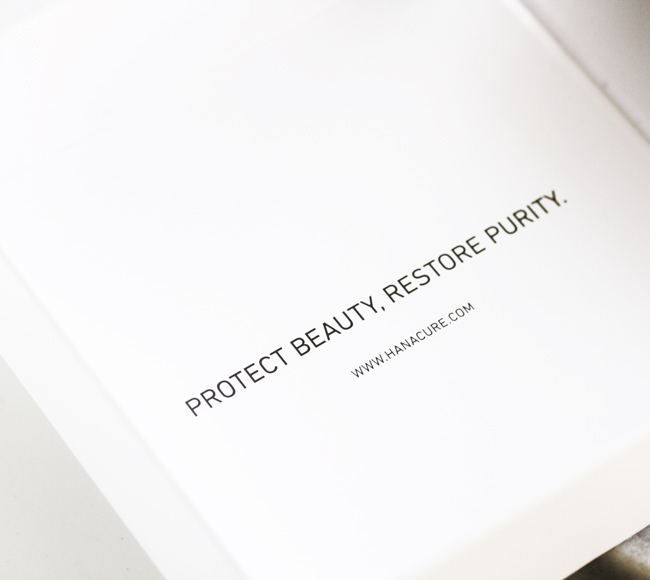 Inspired by the Lotus flower, a symbol or rebirth and purity in Asian culture, and with efficacy and efficiency in mind, Hanacure combined a foundation of traditional Korean skincare with modern technology to create a transformative skincare system that would produce similar renewing and rejuvenating effects on the skin. Designed to be appropriate for all skin types, the patented CO2 OctoLift technology in this multi-action treatment gel mask is designed to lift and firm skin, correct dark spots and uneven tone, minimize pores, fade lines and wrinkles, and brighten and detoxify, all at once. The brand promises visible, age-reversing results if used once a week for four weeks. Lifting Serum: Water, Portulaca Oleracea Extract, Camellia Sinensis Leaf Extract, Benincasa Cerifera Fruit Extract, Polyepsilon-Lysine. The chemical and cruelty free formulation includes a combination of dermatologist tested botanicals and peptides. The antioxidant and mineral rich botanicals which include Lotus Leaf Extract, Oriental Raising Tree Extract, Green Tea Extract, Honeysuckle flower extract, rosa canina fruit oil, peony root extract, sophora root extract all have anti-inflammatory properties that are known to soothe and detoxify as well as regenerative properties that help to restore moisture and stimulate blood flow to awaken the complexion. Nicotinoyl Dipeptide-23 and Nicotinoyl Dipeptide-22 are cross-functioning vita peptides that work in unison to control activation of melanin cells while stabilizing those that are already present resulting in brighter, more vibrant looking skin. Acetyl Hexapeptide-8 also known as Argireline is a natural compound derived from plants that is used to reduce the appearance of wrinkles brought on by repeated facial expressions. Copper Tripeptide-1 which naturally occurs in the human bodies are peptides with skin regeneration effects which can produce more stem cells needed for regeneration and the suppression of scars. A Lifting Serum, Gelling Solution, and brush are enclosed inside each kit which is presented in a modern yet luxurious looking box. The clinical aesthetic is appealing and means business at the same time. For maximum purity and freshness, the contents of the mask should not be mixed together until ready for use. A Lifting Serum, Gelling Solution, and brush are included in each kit. After opening the bottle of Lifting Serum, the contents should be poured into the Gelling Solution pod, closed and shaken for about 20 seconds. This will activate the mixture turning it into a purifying gel compound. Using the brush, you paint the treatment onto your face, covering everything but your eyes and mouth. They recommend using the excess on your neck or the tops of your hands. Let dry for 30 minutes during which you're advised to minimize facial movements in order to maximize it's effects. 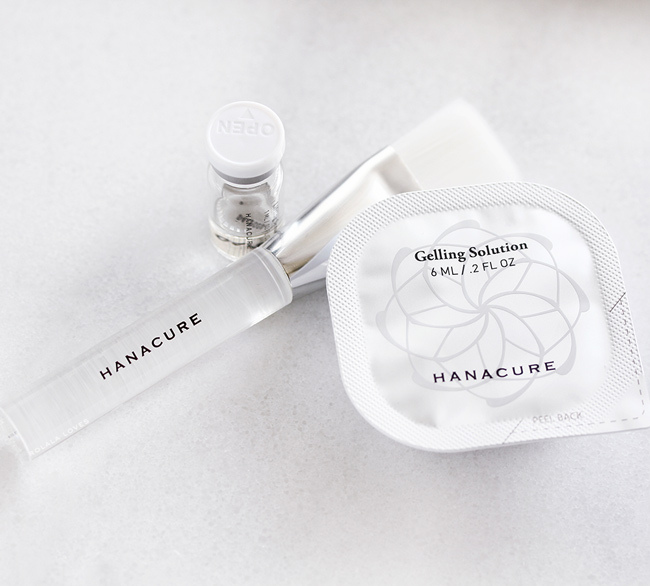 Hanacure recommends fanning yourself or blow drying your face on the cool setting to increase the efficacy of the mask. After the allotted time, rinse off with warm water. 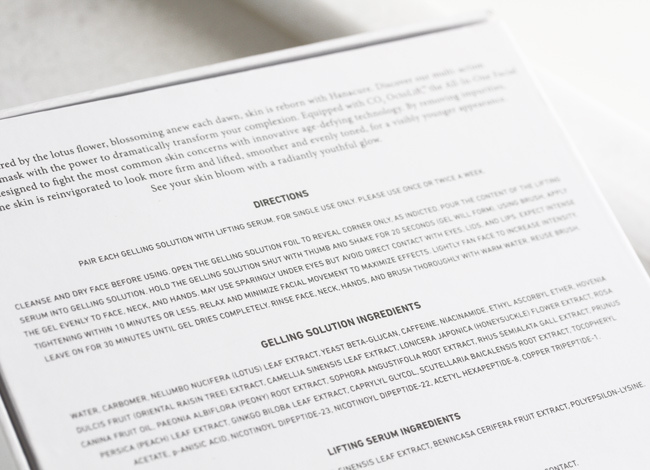 The product comes with a detailed booklet with clearly illustrated instructions which I made sure to read before using. I followed the directions to a tee. The purifying gel compound which is fragrance- free had a slight cooling feel upon application which I did not expect. After covering my entire face, I used the rest on my neck and tops of my hands because there's no sense in wasting it since each application can only be used once. After a few minutes I noticed a tingling sensation and slight pulling on my face. Since I was expecting this it didn't faze me. I occupied myself with a book as I waited. After 15 minutes, my face was warm and I felt a tinge of pulsing on both my cheeks as the mask tightened up more. This occurs as the botanical extracts are working to absorb impurities and the peptides combat the signs of aging. With my face totally petrified and immobilized, I began to understand why this treatment is sometimes referred to as a "zombie mask" because you do end up looking like one thanks to the wrinkle-like cracks and sunken effects which form. Here is the mask in action on actress January Jones. No I did not take any photos of myself in the mask because I looked truly terrifying and that's not something I need to preserve for posterity. Besides there are an abundance of photos out there of people with the mask on. I had concerns that I might not be able to withstand the entire 30 minutes because I always tend to want to fidget when I'm not supposed to but the tingling and pulsing didn't bother me too much and with 5 minutes to go I even started fanning my face to maximize the intensity. The mask rinsed off very easily as I splashed my with tepid water without any residue and of course I couldn't wait to see the results. They were rather unremarkable but at least my skin wasn't red or rashy which has happened to some people. That is apparently a normal reaction as a result of the improvement of blood circulation the mask induces. After applying my usual evening skincare routine, I took a good look at my face again and noticed that my skin still looked like my skin but so much better. It appeared practically poreless, more even toned and firmer. It also felt super soft and smoother than ever. When I woke up the next morning, my face looked plumped and glowing even though I had to get up early and didn't get as much sleep as usual. My complexion just looked better overall and I was even complimented on my skin at an event the day after by a model and an aesthetician. The Hanacure All-In-One Facial is not only Instagram famous, it's amassed many loyal followers from celebrities to regular folks and demand is so high that it has managed to regularly sell out since it's debut. I waited about a month and half to get mine after I placed my order. 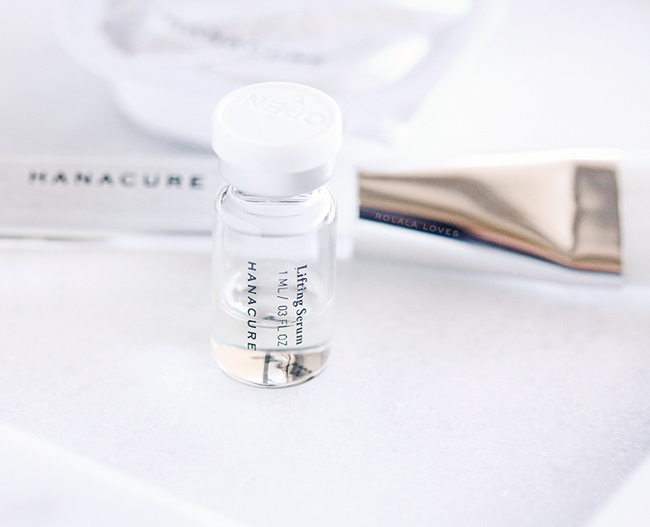 With that said, the Hanacure All-In-One Facial isn't a miracle mask but it is a truly effective treatment that actually lives up to it's claims to address multiple issues. That alone sets it apart from other at home facial treatments. The brightening effect does wear off after a day but the textural change and lifting is real and my usually dry skin also felt more balanced for about a week after. That was impressive and not something I've seen with any other at home treatment I've tried. I would say the results are on par with professional spa facial. Satisfied with these results, I actually just ordered the four-mask kit because if I got such fantastic results with just one use, it would probably be even more transformative after a month's worth of treatments since the effects are supposed to be cumulative. I may need this when I'm older you know. I will say that I read so many reviews of this mask before trying it and they ranged from terrible to amazing. Had this flushed my skin, I would probably be singing a different tune. All I'm saying is that as with anything, individual experiences/results will vary. The price may be expensive but to put it in perspective, it's still a fraction of the price of a single spa facial which usually costs upwards of $80 and for me the results were comparable. You can also do this yourself in the comfort and convenience of your own home. I don't really go for professional facials much anymore since my spa is a not so relaxing trek uptown and because I have problems staying still so this is a viable alternative. 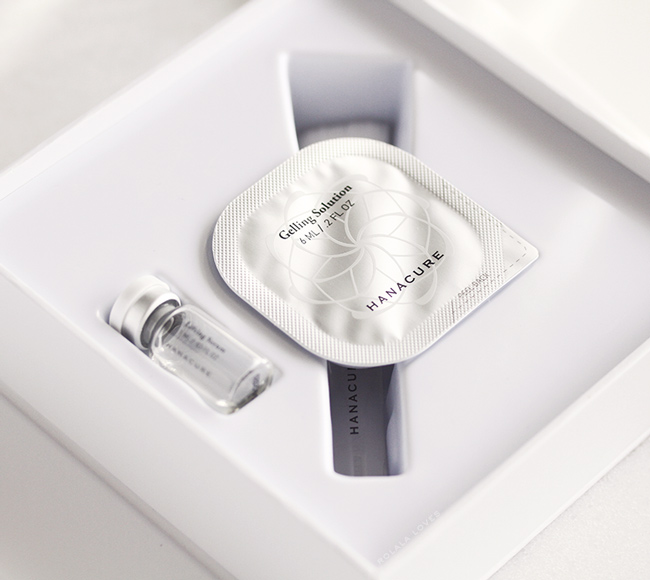 The Hanacure All-In-One Facial comes in a starter kit with a single-use application for $29, or a set of four for $110. It can be purchased direct from Hanacure and at Violet Grey and Barneys NY. 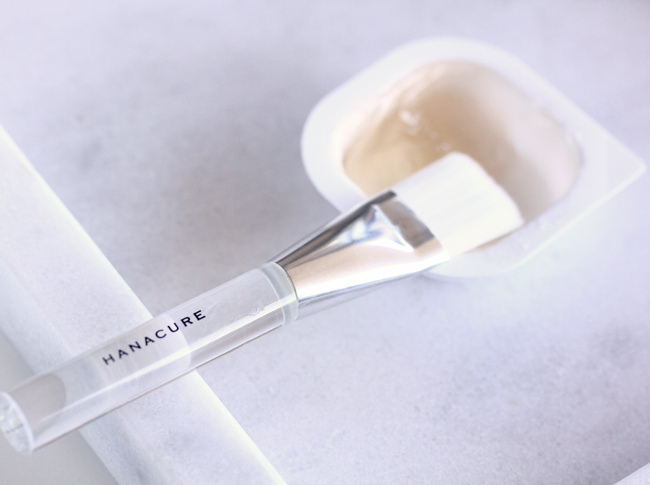 I remember hearing about this Hanacure mask and wondered how it was, although I was hesitant after reading very mixed reviews. Thanks for sharing your review, since everyone has different experiences it’s lovely to hear that you had some positive results. Such an incredible mask, I need to try it! Best.Title.Ever. And chingu, we need to see that pic of you wearing it or it never happened...bwahaha....Kidding aside, this mask does sound pretty freaking awesome. 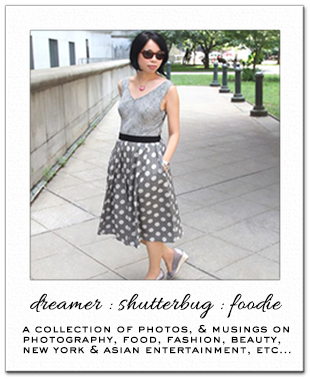 I'm such a cheapskate on some stuff, but I wouldn't mind splurging on this. Valid Point! I don´t really go for facials anymore, too, as I have yet to find someone that I trust my skin with... I have had a few bad experiences after the move. It does seem like a very impressive mask, and with the results that it delivers, it is understandable why it was embraced by both celebrities and regular people. I can also understand why there are mixed review out there as you can never make one product that will fit all skin types and sub-types. I'm glad to hear that it worked for you. To have a face mask whose effects last for a week is to get your money's worth. It's a bit on the pricey side, but with the benefits it offers (not often find in a home treatment! ), it seems to be worth the investment. Thank you for this detail review. I would be willing to endure the tingling and tightening sensation to get a good result. Handcure sounds like a promising product and it's good that the mask can be used on all skin types! I have seen this mask all over social medias but the price deterred me from giving it a go. Maybe in the future my curiosity will get the better of me but for now, I'll just enjoy seeing others using it. It's certainly pricey for a mask, but I'm happy to hear that you liked it. It's crazy how it makes you look so wrinkly at first. I had never seen it before this blog post. Yes I have heard of this mask and wow you are brave to try it! The results sound decent, though $29 for one application is a bit steep. I have ruddy Irish English skin so may be a bit too much for me but I am curious to try it. HaHa Rowena! I kept holding my breath as you were describing what you experienced! I knew it was either going to be really good or really bad. I was scared for you. So glad to hear it worked and you ordered more. I hadn't heard of this. I have to take a look at some of the videos. Thanks for sharing your experience. I've been seeing ads for this all over Instagram and thought the packaging looked really sleek, but I was hesitant about its effects. So glad to hear you got great results with them, and that it was comparable to getting a facial! I'll have to add this to my wishlist to try one day! Ahh yes it's such an insta-famous mask! I'd try it out because I'd love to see the tightening and plumping effects. I'm hoping to go to Korea some time and just bring back a big haul haha. This sounds and looks amazing. It's a little out of my price range, but I think that I will but just the one and give it a try. Oooh I've been wanting to try this. I actually can't remember why I didn't buy it originally. I was close to it but something made me stop. Maybe price. Or maybe shipping. But I still want to try this. The hype has been spectacular. I might need to look into this again. I'm having issues with pores now and hopefully this might help. Wow that looks insane, at first I thought it was like a gel nail product. I love the packaging. Very intriguing. Your description kill me but I do know what you mean especially in regards to the zombie effect before you see result need to track this down. Great review. I would love to try this. I have bad skin discoloration with light and dark patches. It really bothers me and I would love to be able to do something to at least minimize it. I can live a full, happy life without this. wow such a wonderfull mask dear i love it & i want to try it.. I would love to try this mask. I have a multitude of problems to address with my skin.